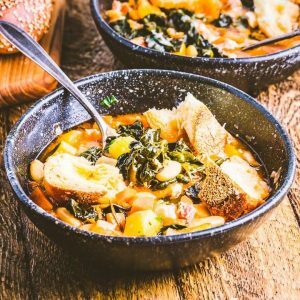 Ribollita soup is healthy, hearty and comforting kale and bean soup. It’s easy to make and can be adjusted based on your own personal taste preferences. Maybe you like more beans or green veggies or maybe you want to leave out the carrots. It’s all fine. This is a recipe for a basic ribollita. It’s great just like this, but feel free to add some more ingredients into the mix if you like! 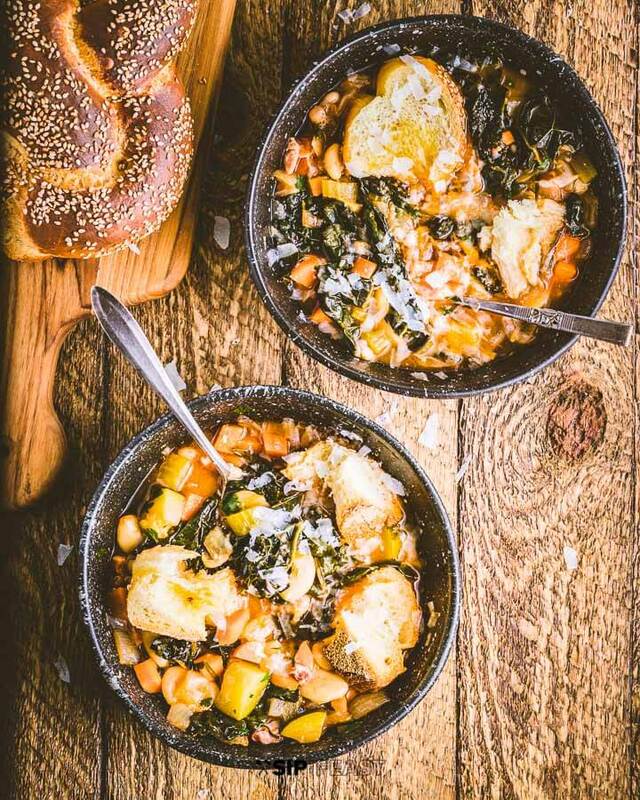 Ribollita which literally means reboiled is a Tuscan bean stew that contains cannellini beans, Tuscan Kale (lacinato kale), carrots, celery, onions, and lots of day old bread. It’s sometimes started with pancetta, and cooked with the rind of a parmigiano reggiano block. 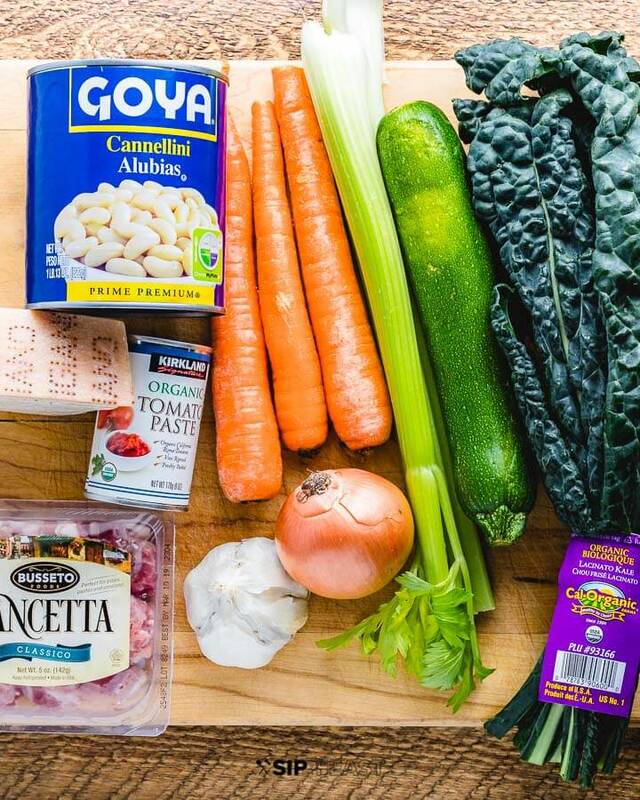 All of the ingredients listed above are in our version of Tuscan ribollita. Only thing else you’ll need is some good olive oil, zucchini, fresh parsley, rosemary, a touch of tomato paste, chicken stock and a bit of time. The texture of ribollita will vary based on whether you have it the next day “reboiled”, like the name of the soup implies. When it’s reboiled and cooked with a lot of stale bread in it, it will take on the consistency of a very dense almost porridge like soup. 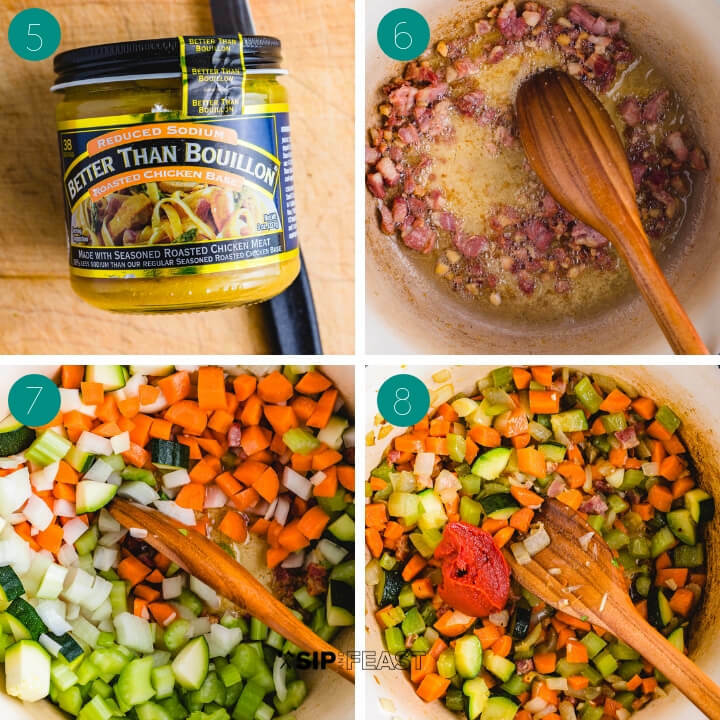 Make a huge pot, or double/triple the recipe to have it the next day. You should do this – it’s a soup that really lends itself to being eaten for the next couple of days. The flavors will blend together even more, and no doubt the soup will taste even better. A note about the bread. Day old bread, even a few days old is fine because it will be used in the soup as a thickening agent. Don’t let a fresh loaf of Italian bread stop you though, because that’s even better. Use some in your soup and have some on the side too! Start by removing the stems from the kale with your hands. Give it a light chop or hand tear the leaves apart. 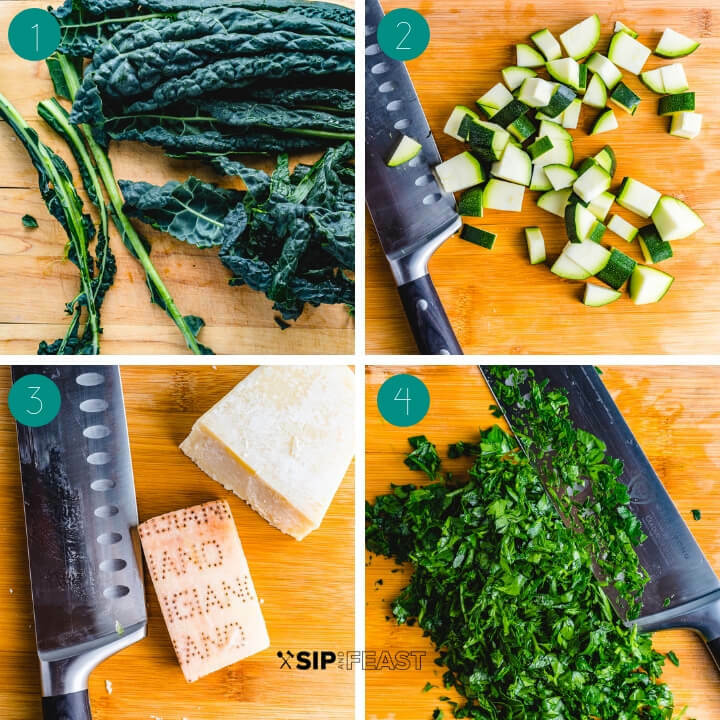 Chop the zucchini into bite size pieces. Also, chop 2 cups onion, 1 cup celery and 1 cup carrot into bite size pieces like the zucchini pic above. Save the ends of your parmigiano reggiano blocks. If you don’t have one and the block is almost finished, just chop it off like shown. Chop a 1/4 cup of fresh parsley and mince 6 cloves of garlic. Prepare 6 cups of low sodium chicken stock. We use chicken base often for this purpose. Box stocks work well, and of course if you have made homemade chicken stock absolutely use that! In a large pot saute 4 ounces of pancetta on medium heat in a 1/4 cup of olive oil. After about 5 minutes of cooking, add in the garlic and cook for 2 more minutes until golden. Add the onion, carrot, zucchini and celery and cook for 7-10 minutes until well softened. Add 3 ounces (half a can) of tomato paste, mix it around and let it cook for a few more minutes. Next, add the Tuscan kale and stir it around. Add in the 6 cups of chicken stock, the cannellini beans, 1 large sprig of fresh rosemary and the rind of the parmigiano reggiano. Also, if desired add the 1/2 tsp of crushed red pepper flakes at this time. Bring to a simmer, then turn heat to medium-low. After the soup has cooked for 30 minutes or so (feel free to let it cook a little longer – the beans will break down more), taste test it and if necessary add extra salt, pepper, and more crushed red pepper. Add the parsley and a nice drizzle of extra virgin olive oil right into the pot. Bring the pot to the table and ladle the soup over pieces of stale Italian bread. Drizzle and offer more extra virgin olive oil, grated parmigiano reggiano, crushed red pepper and bread at the table. The soup will thicken more after the bread breaks down. Alternatively before serving, bread pieces can be cooked in the soup during the last ten minutes. Honestly, you can cook them in the pot for 30 minutes or more to make a very thick hearty ribollita soup. It all comes down to personal preference. 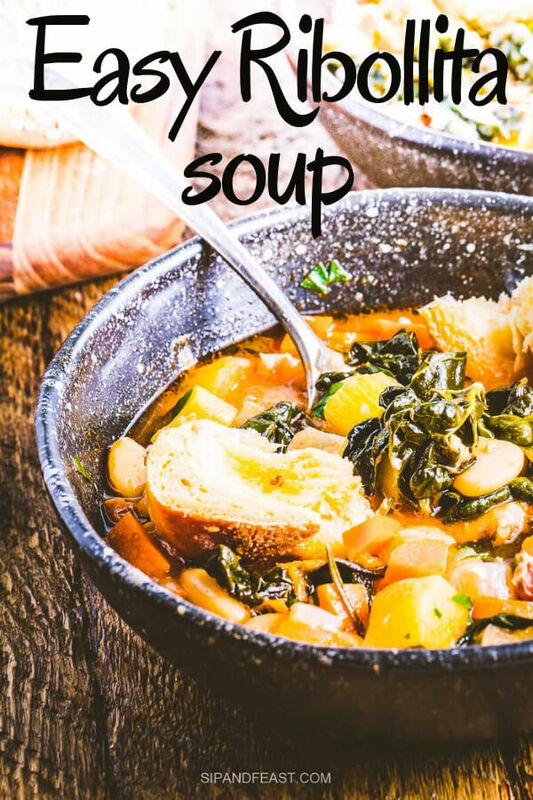 veggies – Kale is the base – feel free to increase the amount in your soup. Chicory, spinach, and other varieties of kale are all worthy additions. Zucchini can be omitted, or substituted with fennel or leeks. Or add them all! herbs – Thyme, basil, oregano or marjoram are all great herbs to add or substitute to this recipe. beans – One of our favorite additions is butter beans. They are basically a bigger cannellini bean and look so nice in the soup. Chickpeas are also quite nice in the soup. lemon, zest – For added freshness – go easy as it can have a strong effect. Red wine vinegar could also be used. 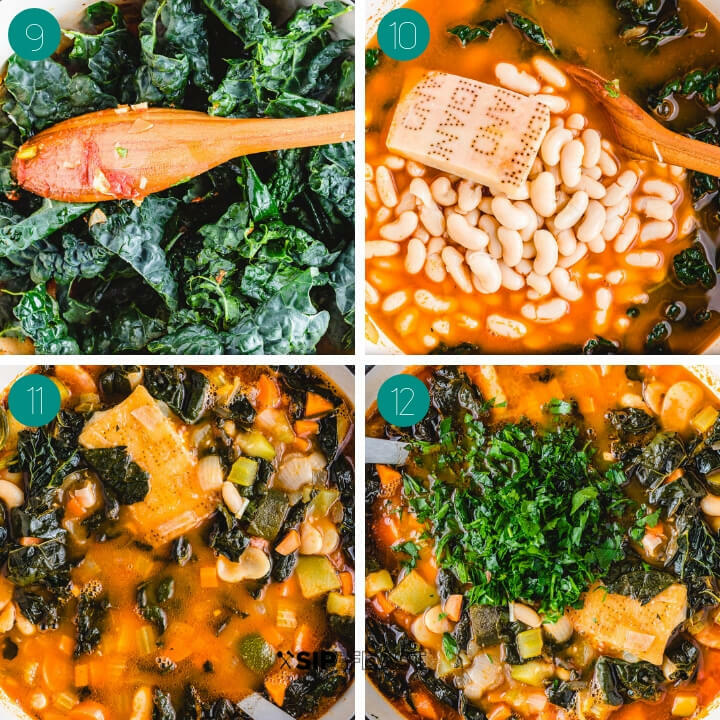 The ribollita soup keeps well for a few days and is great to freeze for a make ahead meal. It tastes even better the next day and will have a more robust flavor and thicker consistency. If too thick just thin the soup with some water, as you would normally do in a Pasta Fagioli or Pasta e Ceci recipe. Ribollita soup can of course be thickened with day old bread or any bread for that matter, but breadcrumbs are a great way to do it as well. Lightly toasting a cup or two of breadcrumbs and serving them on the table is a nice addition. Want More Italian Comfort Food? 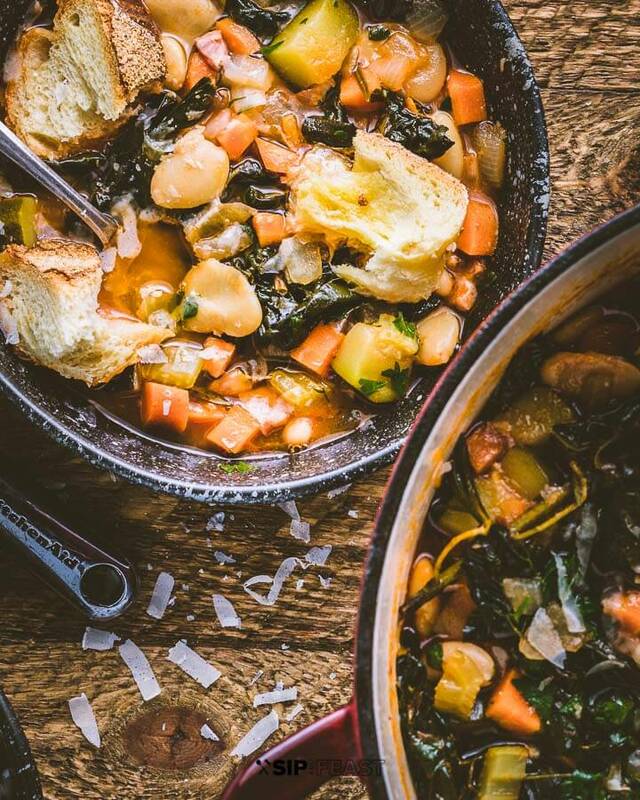 If you liked this hearty Tuscan ribollita soup we’d really appreciate it if you would share it on Instagram or Facebook using #sipandfeast. Begin by removing kale stems and lightly chopping leaves. Mince 6 cloves garlic. Chop 2 cups onion, 1 cup celery, 1 cup carrot and 1 cup zucchini into small bite size pieces. Chop the fresh parsley. Saute the 1/4 pound of pancetta in a large pot in a 1/4 cup of olive oil on medium heat. After 5 minutes add the garlic and saute for 2 minutes more. Next, add all the diced veggies except the kale and cook until softened for about 10 minutes. After the veggies have softened, add the tomato paste and cook for 3 minutes more, then add the kale and stir to combine. Add the stock, cannellini beans, parmigiano reggiano rind, crushed red pepper flakes and rosemary to the pot. Bring to a simmer then lower heat to medium-low and let cook for 20-30 minutes. When soup has finished cooking taste test and adjust salt and pepper if necessary. Add the parsley and a large drizzle of extra virgin olive oil and stir to combine. 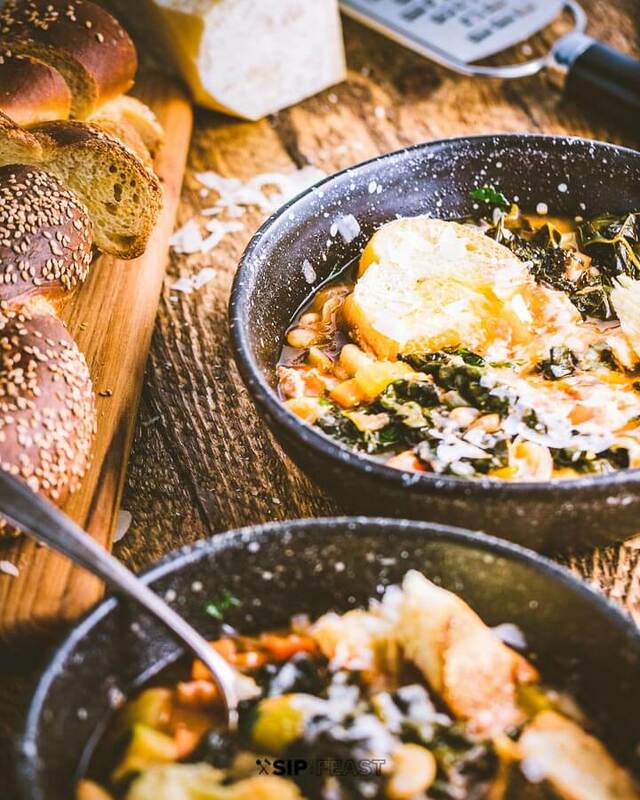 Ladle the soup over pieces of day old bread in individual bowls. Serve with more bread, grated parmigiano and extra virgin olive oil on the side. Enjoy! No extra salt was added, adjust accordingly. Use a 1/2 cup of grated parmigiano reggiano in place of rind if required. Serve with plenty of bread to thicken, extra virgin olive oil, crushed red pepper, black pepper and grated cheese on the side. The soup is even better the next day. If too thick, just add some water to thin out when reheating. Jim this looks amazing as always. I know it was to stretch the buck, but bread in soup is just such a brilliant flavor move IMO. Thank you Jo! It definitely does save money, but in the end I think it just adds so much great flavor.